Recorded around the same time as "Rock the Carthatic Spirits" but released a few years later. Vibe Music, recorded at Green Street studios in 1995, has a very different trajectory than that of the former hard driving "Rock the Carthatic Spirits" cd. Where "Rock" was trans-genre funk rock Vibes Music is more atmospheric, bluesy and oblique. "Auqa Blu" connects the life cycle of salmon going to spawn before death with a doomed relationship. Bourelly's guitar calls out like a trainer on a football pitch, shouting out short riffs in between the vocal phrases. 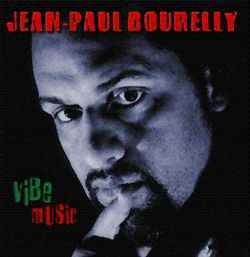 And while straight ahead tunes like "Move On" get crowded, in a post Hendrix kind of way, tunes like "Jubies Jones", "Boom Town Ballad" and "Only the Lonely" shows that Bourelly can open up the creative valve and you are suddenly in an other worldly groove space. A good example is "Soul is Red" one of Bourelly's classic, dramatic tone poems that are scattered throughout this recording. The electric guitar sweats hot fever over a hypnotic, swirling, harmonic sea bed. The BluWave Bandits members Alfredo Alias, Melvin Gibbs and Mark Batson are in good form as a rhythm section on the other tracks and Bourelly's Chicago homeys Kdog Johnson and Lonnie Plaxico conjure up the best part of the 70'ish jazz vibe on "Only the Lonely". Other notable appearances are the passionate tenor sax of Booker T and a very young and promising DJ Logic who's samples deliver street cred on the same track.